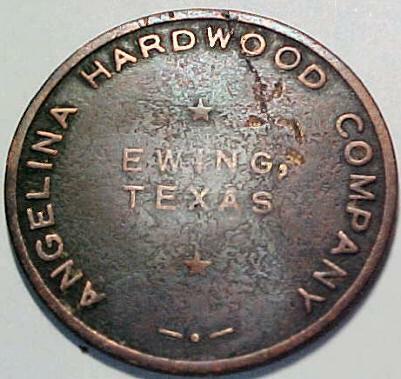 Ewing Token, Angelina County. Image available on the Internet and included in accordance with Title 17 U.S.C. Section 107. EWING, TEXAS (Angelina County). Ewing was on the Angelina and Neches River Railroad ten miles southeast of Lufkin in northeastern Angelina County. It was the site of a hardwood lumbermill, active from 1920 to 1944. S. W. Henderson and H. G. Bohlssen formed a corporation called the H. G. Bohlssen Manufacturing Company and built a mill at a site near the Angelina River. The corporation was capitalized at $200,000, and stock was divided among thirty-five stockholders. Bohlssen died in the early 1920s, and after his widow sold out to Henderson the company name was changed to Angelina Hardwood Company. James A. Ewing, one of the stockholders, gave his name to the post office granted to the community in 1920. The old Ewing plantation belonging to his family had had the largest number of slaves in Angelina County at the time of the Civil War. The first postmaster was John Bohlssen. Mail service was transferred to Huntington in 1944. At its largest, Ewing had nearly 1,000 inhabitants, several stores and churches, and many houses. The largest number of businesses listed for Ewing by the Texas Almanac was eight during the 1930s. The mill produced 40,000 feet of hardwood a day and employed 250 men. Around 1944 it was closed because the available timber was exhausted. In 1945 Ewing had only one business and a population of fifty, and shortly after that it was abandoned. The Texas Highway Department lists it as an abandoned railroad station. During its two decades Ewing survived a large number of grave misfortunes. One of the founders of the hardwood mill, Bohlssen, was crushed to death by a falling stack of lumber about 1923. In 1924 a fire broke out in the plant and ravaged the town. From 1931 to 1933 the mill had to close because of the Great Depression. Not only the shortage of timber in the 1940s, but also the shortage of labor due to World War II, forced the closing of the mill. Moreover, while the operation was being dismantled, John Henderson, one of the co-owners, fell into a burning pile of sawdust and was killed. The spirit of the town, however, was kept alive in the late 1980s through yearly reunions of its former inhabitants, held each autumn in Lufkin. Angelina County Historical Survey Committee, Land of the Little Angel: A History of Angelina County, Texas, ed. Bob Bowman (Lufkin, Texas: Lufkin Printing, 1976). Bob Bowman, This Was East Texas (Diboll, Texas: Angelina Free Press, 1967). Archie Birdsong Mathews, The Economic Development of Angelina County (M.A. thesis, University of Texas, 1952). Handbook of Texas Online, Megan Biesele, "EWING, TX (ANGELINA COUNTY)," accessed April 22, 2019, http://www.tshaonline.org/handbook/online/articles/hve41.